A seasonal drop in food prices, combined with a decline in consumer demand, is among the main reasons why Russia is facing deflation, for the first time in five years. Rosstat, the state statistics agency, has provided figures in the beginning of August to indicate that Russia is now encountering deflation. The figures show a drop in prices of consumer goods. Prices have fallen by 0.1 percent in the first week of the month. "For the Russian economy the decrease in inflation is good news. If things do not change, this will lead to inflation reaching the four percent that the Russian Central Bank has set for 2017 faster," said Timur Nigmatullin, financial analyst at Finam Holding (in comparison, inflation in Russia was 12.9 percent in 2015). This is the goal that the Russian regulator set at the end of 2014 when it introduced the floating exchange rate and provoked the ruble's fall against the euro and dollar by 50 percent. According to analysts, in 2016, as five years ago, deflation can be explained for seasonal reasons. "Usually, in the summer, prices of food significantly decline. 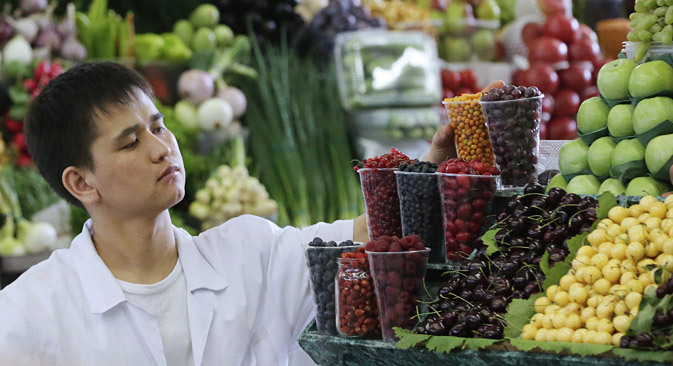 Fruits and vegetables are cheaper since new crops arrive at the market," noted Andrei Kochetkov, analyst from Otkrytie Broker. “In large cities, prices on services fall because of the holiday season. Commercial networks often hold sales and various promotions in order to attract buyers in these calm months,” he said. There are, however, more basic reasons for the fall in prices. Declining consumer demand is playing a significant role, noted Mikhail Poddubsky, analyst at TeleTrade. The fall in GDP has made it more and more difficult for Russians to maintain their former spending volumes, since the level of their real incomes has decreased, he said. However, despite all the restrictions, the deflation is still positive news for the Russian market. "It increases trust in the national currency and should have a good effect on economic activity," explained Dmitri Bedenkov, director of the analytical department at Russ-invest. He noted that, first and foremost, the decrease in inflation raises the consumers' purchasing power if their incomes are stable. The deflation recorded in the beginning of August indicates that Russia can, by 2017, reach an inflation level of four percent for the first time in its history, said Bedenkov. Such an outcome would be attainable because of the strict credit-monetary policy. "Interest rates in the financial market are over 10 percent, which limits people's access to credit and impedes economic growth," he noted. “This is still good news for the population since it will lead to the growth of real disposable incomes and the reduction of interest rates on credit, including those on mortgages, added Nigmatullin. Konstantin Korischenko, former Deputy Chairman of the Russian Central Bank and Deputy Head of the RANEPA Department of Capital Markets and Financial Engineering, said for inflation to reach four percent, it was necessary that oil prices increase and the Western anti-Russian sanctions be lifted. "It is more realistic that by the end of 2017 inflation will fall to five or six percent," predicted Poddubsky. He stressed that since the Russian economy is significantly dependent on imports, the ruble exchange rate will also have a big influence. The weaker the ruble, the more difficult it will be for Russia to reach the desired inflation level, Poddubsky concluded.